Thread: ASF tank lab block hopper instructions with detailed pics!!! Re: ASF tank lab block hopper instructions with detailed pics!!! Ouch... 28$? Mmm, I'm sorry Mike but my way is cheaper.... Those zipties are too expensive. I can make a hopper pretty quickly and easily without the metal zipties. Just takes some practice and it's smooth sailing. I don't know if anyone mentioned, but you can use c-rings as well in place of the metal zipties. 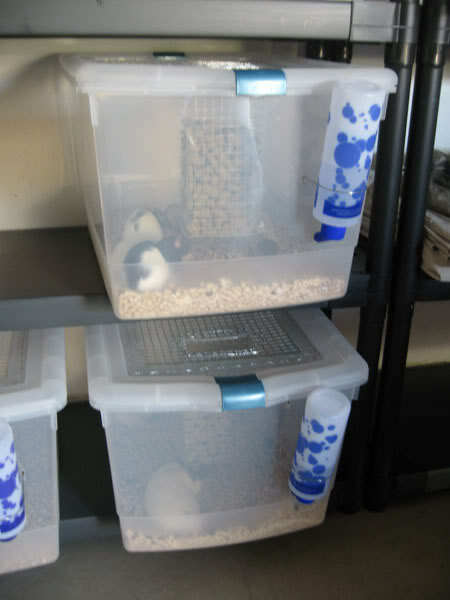 We used them to put together one of our rat cages. Should be over by the hardware cloth area in a farm store. They use them for the hardware cloth to make rabbit cages and such. A lot cheaper, and in my opinion easier than zipties. "I'm sorry Mike but my way is cheaper.... Those zipties are too expensive. I can make a hopper pretty quickly and easily without the metal zipties. Just takes some practice and it's smooth sailing." Yeah metal zip ties killed it for me. Can you post pics of the way you do it(build hoppers lol) and the c rings please. We based our design on Peter's - thanks Peter! I'm expecting the small holes where the water bottles are, wont stay small forever. Rats have a way of finding any breach like that, then it wont be long. Let me know how those tubs hold up. I like the way you can load the food hopper from the top. I need to build a rack like Ralph Davis makes. The food hopper is on top.Looks like a couple hundred bucks though. Had them for...5 months now? and they haven't touched the water bottle holes. These Rubbermaid tubs have molded feet on them and in a few of the tubs, they've nibbled on the molding of the feet, but not enough to escape. Well, I don't use anything but hardware cloth and a needle nose plier when I make my hoppers, but I do know that the c-rings can be used for them, since they are made for hardware cloth. This is my way to make a hopper, takes me about ten minutes start to finish. Sooo worth picking up if you have a bunch of hoppers to make. wow thats looks great! glad I could help! Why do you make them so big??? how many weeks of food is that? Anyways, I would venture to say that my design can be assembled faster then yours. To bad we can't have a race!!! I can say they have held up very well. I make them big, because big rats eat big foods. Anywho.. correction on my part, C-rings are hogrings (still useable for caging)... J clips are what I have pictured, and they are the BOMB! It's pretty rare of any of our tubs to get chewed around the water bottle spigot. The trick is to melt the hole just big enough for the spigot to go through and not a bit bigger. If it's fit tight like that they don't seem to bother with it at all (at least my rats don't).